What I like most about hybridizing talk is that it's so forward-looking and full of possibilities. What if? How could we? And although it's easy to get discouraged -- by the time it takes to hybridize, the space it takes to grow them out, and the plants you grow just for hybridizing potential -- hearing other people talk about their hybridizing project(s) is always good for the heart. 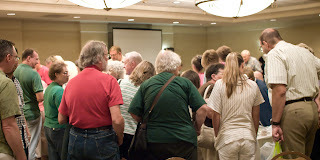 The presentation was set up in half of one of the banquet rooms, and attendance was so high that all seats were taken. (I'd say standing room only, but we snagged some chairs from the other half of the room.) Pictured here is the crowd gathered around the raffle table which was stocked with tubers and leaves etc. for everyone. Dale Martens' presentation was mostly on hybridization of Streptocarpus for compact size - so packed with information that you really need to hear it twice. If you took notes, you missed things, and if you didn't take notes, your memory has to be a lot better than mine.... She covered not only her hybridizing, but also the efforts of Kenji Hirose and Toshijiro Okuto of Japan, Harold Koopowitz's crossing of Streptocarpus meyeri and dunni (memorable to me because I've heard him speak about hybridizing for teacup-sized Paphiopedilum) and others. 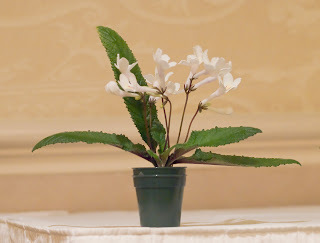 The last part of Dale's presentation featured new hybrids in other genera, including miniatures like Jim Steuerlein's Sinningia Li'l George (sp Rio das Pedras x concinna), and Dale's intergeneric with Gloxinia perrenis, Seemannia gymnostoma and purpurascens. Peter Shalit also presented an in-progress report on hybridizing with Sinningia speciosa (wild forms), guttata and lindleyi, thus far resulting in guttata-like plants with varying flower color and spottiness (smaller spots, spots in stripey formation, etc.). I walked away with one very practical tip from Dale's presentation - mark the potential seed pods using a dab of acrylic color on the calyx, and then insert a tag in the pot identifying the parentage for each color. This beats dangling tags or tying color string on each flower!